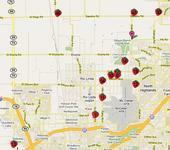 A map of strawberry stands in Sacramento. Last Friday afternoon, the sales manager at Produce Express in Sacramento, Jim Mills, drove to Chiam Lee's small farm south of Galt to pick up six cases of the most delicious strawberries you've ever tasted. Mills delivered them to Karen's Bakery in Folsom, a company that needed superb fruit for a charity event. It used to be, Lee only sold strawberries at his roadside stand, and rarely six cases at a time. But thanks to a connection facilitated by UC, he has a new and much larger market for his produce.